At Feldmanis Family Dentistry, your Eugene, Oregon dentist of choice, we believe that there’s nothing better for your dental health than the healthy maintenance of your teeth. Root canal treatment may be required in order to save one of your teeth. Root canal therapy treats teeth that have contracted infection deep inside the nerve tissue. This infection can be caused by a variety of conditions, including injury, a cracked tooth, or decay. There may be no visible signs of the infection, but without treatment, this infection can result in pain or lead to an abscess. 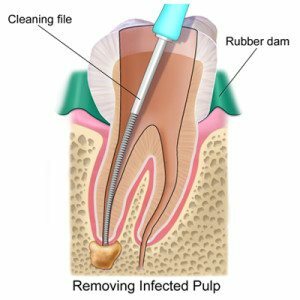 A root canal is a treatment that will save your damaged tooth, restoring the health of your tooth through removing the infected nerve tissue, treating any remaining infection, and filling the empty root canals with medicated dental materials. Antibiotic treatment may also be required in conjunction with root canal therapy. Root canal therapy usually involves one office visit for Dr. Feldmanis to complete. Afterwards, it is essential that you return to have a crown or other restoration placed over the tooth to protect it. For the first few days after treatment, your tooth may feel sensitive, but any pain can be relieved with over-the-counter or prescription medications as needed.